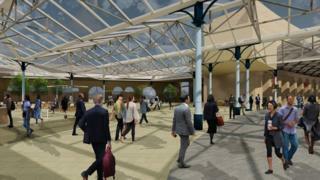 Plans for a £5.2m upgrade to Newcastle Central Station have been revealed. They include a new western entrance opposite the Centre for Life, a new short-stay car park and taxi pick-up point and new area for passengers inside the station. Newcastle City councillors are expected to approve the scheme’s funding later in February. If planning is approved, the work would begin in 2019 and should be completed in 2021. Newcastle City Council’s cabinet member for employment Ged Bell said previous works, including the installation of a glass portico and shops, have “given visitors a much more pleasant arrival” at the “jewel in the crown of the North East rail network”. He said: “With more and more people using rail we need to make further changes in and around the station, so it is fit for purpose, and we can meet air pollution targets with better traffic flows at the front of the station. 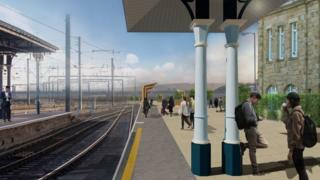 The council hopes the redesign will then lead to the creation of a multi-storey car park on the Forth Goods Yard by 2023, as well as new homes and offices. Yearly passenger numbers are expected to rise from 8.7 million to 12 million by 2023 and the upgrade would enable longer platforms for new trains, according to the Local Democracy Reporting Service. Newcastle City Council would pay £150,000 with £3.3m from the North East Local Enterprise Partnership and remaining costs covered by London North Eastern Railway (LNER) and Network Rail, subject to agreements.